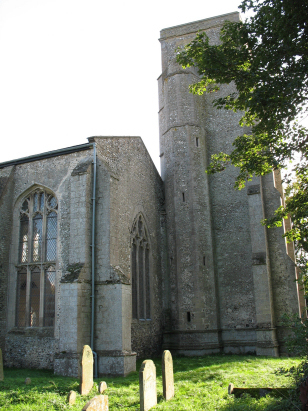 The parish of Hockwold is situated in the far southwest of Norfolk, deep within the Fenland district of the county. Hockwold forms a substantial part of the border with neighbouring Suffolk and a small portion of that with Cambridgeshire. Hockwold sits on the B1112 road which passes from Feltwell through to the Suffolk village of Lakenheath, the area is very low lying standing barely 10 metres above the sea and contains much reclaimed land from the former Fens. Hockwold is located about 3 miles west of the Suffolk market town of Brandon and was merged with the contiguous village of Wilton in 1831 albeit both continued separately to record baptisms. Much of the eastern Fens was reorganised by construction of the the "Cut-off Channel" which runs along the eastern edge of this part of the Fens, in doing so much rich pasture and arable land was created making Hockwold a wealthy place indeed. Following unification the large combined village eventually settled into a single church - that at Wilton being chosen. St Peter is now, therefore, no longer regularly used for worship. The church sits on the western side of the B1112. 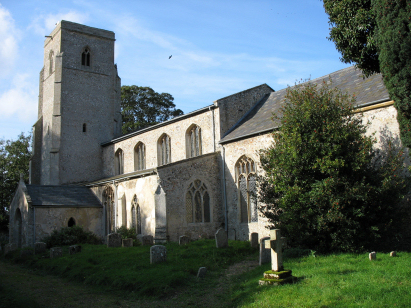 The building is fairly typical of a Norfolk church which the majority of the structure in the Perpendicular style and in this case largely 15th and 16th centuries. The tower, curiously place at the southwest, is earlier and Pevsner gives it a mid-14th century date and notes that there are features which could be much earlier and Saxon in date namely the responds and plinths albeit he cautiously qualifies with a "might be". The church sits just set back a little from the B road behind a low local brick wall and is still well-maintained despite its current status. Two standard 800-entry register books cover the period of this transcript and the second runs onwards to completion in the mid 20th century. Both register are filmed on Microfilm MF1436 in the collection of Norfolk Record Office which was used to prepare this transcript. The film is relatively recent and of a reasonable quality thus making for a straightforward piece to prepare.